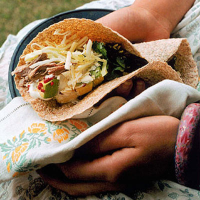 Put together a fresh coleslaw and an avocado, chilli and lime salsa to go in the wraps with the pork. And remember always to warm the tortillas so they are pliable. Preheat the oven to 150˚C/gas 2. Lay the pork flat, cut the skin and most of the fat off and place in a foil-lined roasting tin. Spread the onion, herbs, chillies, spices, vinegar and stock over and around the pork. Cover with foil and seal tightly. Cook for about 3 hours, until the pork falls apart easily. Remove the onion and chillies; shred the pork with forks. To serve, enclose the wraps in a loose foil parcel and warm over the coolest part of a preheated barbecue, or in the oven. Cram in thoroughly reheated pork, cheese, sour cream and coriander, roll up and eat. From California, a refreshing, zingy pale ale from an environmentally friendly craft brewery. Sierra Nevada.